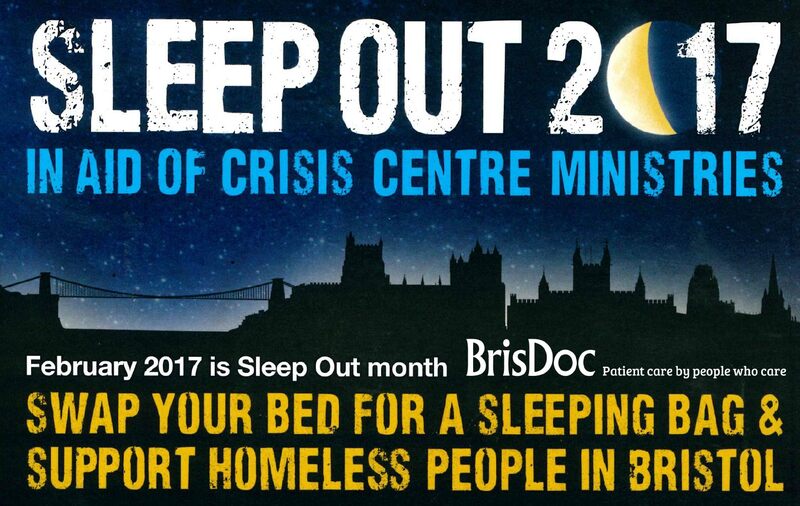 BrisDoc are holding a ‘sleep out’ challenge to help raise money in aid of Crisis Centre Ministries and highlight the challenges faced by homeless people out on the streets every single day. There are currently an estimated 74 people sleeping rough on any given night in Bristol. We are committed to addressing this problem and to helping those who are subject to isolation, humiliation and rejection on a daily basis. But we can’t do it alone. The Challenge: A number of BrisDoc employees will be swapping the comforts of their own beds to spend one night sleeping on the streets. Crisis Centre Ministries run The Wild Goose Drop-In Centre provides free food for the homeless and hungry as well as encouragement, support and advice / signposting for service users. Alongside this we provide volunteering opportunities and also access points for agencies working with this client group. Provide breakfast and lunch four days a week and an evening meal six nights a week for those in extreme poverty and need. Host advisory sessions about housing, finance, employment, health, citizens’ rights, alcohol and drug issues in partnership with local statutory and voluntary organisations. Engage with young people and schools to increase awareness of homelessness issues and to raise support for CCM.